NSA official Thomas Bryan Reynolds meets with U.S. Congressman Phil Hammersley in a public park to discuss support for a new piece of counterterrorism legislation the U.S. Congress is pushing that dramatically expands the surveillance powers of intelligence agencies over individuals and groups. Hammersley remains committed to blocking its passage, since he believes it would almost totally destroy the privacy of U.S. citizens. Reynolds, determined to have the bill pass so as to gain a long-delayed and anticipated promotion within the NSA, has his team murder Hammersley, spread heart pills over his car, place his body in the car and push it in a lake to simulate the cause of death as a heart attack. In the aftermath, they discover that wildlife researcher Daniel Zavitz had a camera aimed in the woods at their location. Zavitz inspects the footage and, realizing he has captured the congressman's murder, calls a journalist he knows. The call is monitored by Reynolds's team who attempt to break into Zavitz's apartment to retrieve the tape. Realizing he is in danger, Zavitz transfers the video to a disc before fleeing the apartment ahead of Reynolds's men. Zavitz bumps into an old college friend, labor lawyer Robert Clayton Dean, and slips the disc into his shopping bag without his knowledge. Shortly after, Zavitz is killed when he collides with a fire truck on a stolen bicycle; Reynolds' men later kill the journalist he'd called previously. When Reynolds and his team discover that Dean might have the video and after failing to convince him (under the guise of police officers) to allow them to search his shopping purchases, they, believing that Dean and Zavitz were in collusion together, raid his house and plant surveillance devices. They then disseminate false evidence to implicate Dean of working with the family of mafia kingpin Paulie Pintero and having an affair with ex-girlfriend Rachel Banks. The subterfuge destroys Dean's life: he is dismissed from his job, his bank accounts are frozen, and his wife Carla throws him out of the house. Dean believes Pintero is behind the smear campaign as revenge for a prior case, with help from Banks' secretive contact Brill. Dean sets up a meet with Brill, to which the NSA sends an impostor, but the real Brill rescues Dean. Brill explains that his pursuers are NSA agents and rids him of tracking devices hidden in his clothing. With Dean and Brill in hiding, the NSA agents kill Banks and frame Dean for the murder. Dean obtains the disc and Brill identifies Reynolds in the recovered video, but the disc is destroyed during an escape from an NSA raid. Brill, whose real name is Edward Lyle, tells Dean of his past as a communications expert; he was stationed in Iran during the Iranian Revolution; his partner, Rachel's father, was killed, but Lyle made it out and has been in hiding since. Lyle tries to urge Dean to run away, but Dean is determined to clear his name. Dean and Lyle trail another supporter of the surveillance bill, U.S. Congressman Sam Albert, videotaping him having an affair with his aide. Dean and Lyle "hide" one of the NSA's bugs in Albert's room so Albert will find it and have the NSA start an investigation into Albert's tapping. Lyle also deposits money into Reynolds's bank account to make it appear that he is taking bribes, putting pressure on Reynolds. Lyle contacts Reynolds to set up a meeting to exchange the video and get Reynolds to incriminate himself. Reynolds' men instead ambush the meeting and hold Lyle and Dean at gunpoint, demanding the tape. Dean tells them that the Hammersley murder footage is in the hands of Pintero, understanding Pintero's restaurant is under FBI surveillance. Dean, Reynolds, and the NSA team enter Pintero's restaurant. With the use of ambiguous language, Dean convinces Pintero that Reynolds is after the incriminating video Dean blackmailed him with and the encounter turns into a massive gunfight that kills the mobsters, Reynolds, and several members of his NSA team. During this ordeal, Lyle uses subterfuge and acting to goad FBI surveillance that Pintero is kidnapping cops, prompting a raid. Lyle escapes while the FBI rescues Dean and uncovers the entire conspiracy. The U.S. Congress is forced to abandon the bill to avoid a national scandal, although they cover up the NSA's involvement to preserve the agency's reputation. Dean is cleared of all the charges and is reunited with his wife. Lyle leaves Dean a "goodbye" message via his TV as he is watching, showing himself relaxing in a tropical location. The story is set in both Washington, D.C., and Baltimore, and most of the filming was done in Baltimore. Location shooting began on a ferry in Fell's Point. In mid-January, the company moved to Los Angeles to complete production in April 1998. Mel Gibson and Tom Cruise were considered for the part that went to Will Smith, who took the role largely because he wanted to work with Gene Hackman, and had previously enjoyed working with producer Jerry Bruckheimer on Bad Boys. George Clooney was also considered for a role in the film. Sean Connery was considered for the role that went to Hackman. The film is notable for having cast several soon-to-be stars in smaller supporting roles, which casting director Victoria Thomas credited to people's interest in working with Gene Hackman. The film's crew included a technical surveillance counter-measures consultant who also had a minor role as a spy shop merchant. Hackman had previously acted in a similar thriller about spying and surveillance, The Conversation (1974). The photo in Edward Lyle's NSA file is of Hackman in "The Conversation." 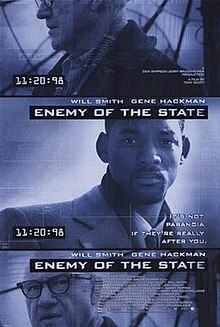 Enemy of the State received 71% positive reviews on the film-critics aggregator Rotten Tomatoes, with 84 critics surveyed. Metacritic displayed a normalized ranking of 67 out of 100 on the basis of 22 critics. Kenneth Turan of the Los Angeles Times expressed enjoyment in the movie, noting how its "pizazz [overcame] occasional lapses in moment-to-moment plausibility;" Janet Maslin of The New York Times approved of the film's action-packed sequences, but cited how it was similar in manner to the rest of the members of "Simpson's and Bruckheimer's school of empty but sensation-packed filming." In a combination of the two's views, Edvins Beitiks of the San Francisco Examiner praised many of the movie's development aspects, but criticized the overall concept that drove the film from the beginning—the efficiency of government intelligence—as unrealistic. Kim Newman considered Enemy of the State a "continuation of The Conversation", the 1974 psychological thriller that starred Hackman as a paranoid, isolated surveillance expert. The film opened at #2, behind The Rugrats Movie, grossing $20,038,573 over its first weekend in 2,393 theatres and averaging about $8,374 per venue. An episode of PBS' Nova titled "Spy Factory" reports that the film's portrayal of the NSA's capabilities are fiction: although the agency can intercept transmissions, connecting the dots is difficult. However, in 2001, then-NSA director Gen. Michael Hayden, who was appointed to the position during the release of the film, told CNN's Kyra Phillips that "I made the judgment that we couldn't survive with the popular impression of this agency being formed by the last Will Smith movie." James Risen wrote in his 2006 book State of War: The Secret History of the CIA and the Bush Administration that Hayden "was appalled" by the film's depiction of the NSA, and sought to counter it with a PR campaign on behalf of the agency. In June 2013 the NSA's PRISM and Boundless Informant programs for domestic and international surveillance were uncovered by The Guardian and The Washington Post as the result of information provided by whistleblower Edward Snowden. This information revealed capabilities such as collection of Internet browsing, email and telephone data of not only many Americans, but citizens of other nations as well. The Guardian's John Patterson argued that Hollywood depictions of NSA surveillance, including Enemy of the State and Echelon Conspiracy, had "softened" up the American public to "the notion that our spending habits, our location, our every movement and conversation, are visible to others whose motives we cannot know." ^ "Enemy Of The State Music Review". Music from the Movies. 1998. Retrieved 2015-01-29. ^ a b "Enemy of the State box office". Box Office Mojo. Retrieved 2008-06-29. ^ "Looking back at Tony Scott's Enemy Of The State". Den Of Geek. ^ Greg Huxtable (May 20, 2013). "ENEMY OF THE STATE - Production Notes". Cinema Review. ^ Willis, John. Screen World Volume 50 (1999 ed.). p. 162. ISBN 1-55783-410-5. ^ a b "Looking back at Tony Scott's Enemy Of The State". Den of Geek. Retrieved February 14, 2019. ^ "Enemy of the State Movie Reviews, Pictures". Rotten Tomatoes. Retrieved 2008-10-25. ^ "Enemy of the State Reviews, Ratings, Credits". Metacritic. Retrieved 2008-10-25. ^ Turan, Kenneth (1998-11-20). "Enemy of the State: 'Enemy' Has a Little Secret: Let the (Nifty) Chase Begin". Los Angeles Times. Retrieved 2008-10-25. ^ Maslin, Janet (1998-11-20). "Enemy of the State: The Walls Have Ears, Eyes, and Cameras". The New York Times. Retrieved 2008-10-25. ^ Beitiks, Edvins (1998-11-20). "High-octane "Enemy'". San Francisco Examiner. Retrieved 2008-10-25. ^ Natale, Richard (1998-11-23). "Rugrats' Outruns 'Enemy'". Los Angeles Times. Retrieved 2010-11-10. ^ Welkos, Robert W. (1998-11-24). "Weekend Box Office : 'Rugrats' Has Kid Power". Los Angeles Times. Retrieved 2010-11-10. ^ Bamford, James; C. Scott Willis (February 3, 2009). "Spy Factory". NOVA. Boston: WGBH Educational Foundation. Retrieved 6 September 2012. ^ "Inside the NSA: The Secret World of Electronic Spying". CNN. March 25, 2001. ^ Zeke J Miller (June 7, 2013). "Former NSA Chief Was Worried About "Enemy Of The State" Reputation". Time. ^ John Patterson (16 June 2013). "How Hollywood softened us up for NSA surveillance". The Guardian.